Berevan Omer graduated on a Friday in February with an associate's degree from Nashville State Community College and started work the following Monday as a computer-networking engineer at a local television station, making about $50,000 a year. That's 15% higher than the average starting salary for graduates -- not only from community colleges, but for bachelor's degree holders from four-year universities. "I have a buddy who got a four-year bachelor's degree in accounting who's making $10 an hour," Omer says. "I'm making two and a-half times more than he is." Omer, who is 24, is one of many newly minted graduates of community colleges defying history and stereotypes by proving that a bachelor's degree is not, as widely believed, the only ticket to a middle-class income. Nearly 30% of Americans with associate's degrees now make more than those with bachelor's degrees, according to Georgetown University's Center on Education and the Workforce. In fact, other recent research in several states shows that, on average, community college graduates right out of school make more than graduates of four-year universities. The average wage for graduates of community colleges in Tennessee, for instance, is $38,948 -- more than $1,300 higher than the average salaries for graduates of the state's four-year institutions. In Virginia, recent graduates of occupational and technical degree programs at its community colleges make an average of $40,000. That's almost $2,500 more than recent bachelor's degree recipients. "There is that perception that the bachelor's degree is the default, and, quite frankly, before we started this work showing the value of a technical associate's degree, I would have said that, too," says Mark Schneider, vice president of the American Institutes for Research, which helped collect the earning numbers for some states. And while by mid-career, many bachelor's degree recipients have caught up in earnings to community college grads, "the other factor that has to be taken into account is that getting a four-year degree can be much more expensive than getting a two-year degree," Schneider says. A two-year community college degree, at present full rates, costs about $6,262, according to the College Board. 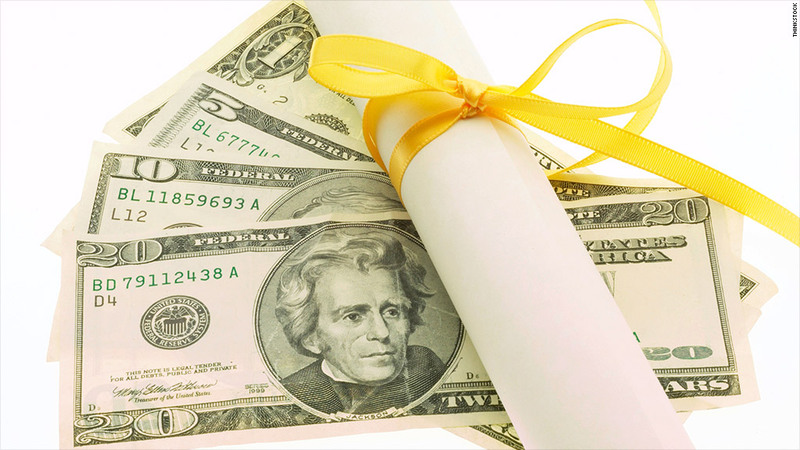 A bachelor's degree from a four-year, private residential university goes for $158,072. The increase in wages for community college grads is being driven by a high demand for people with so-called "middle-skills" that often require no more than an associate's degree, such as lab technicians, teachers in early childhood programs, computer engineers, draftsmen, radiation therapists, paralegals, and machinists. With a two-year community college degree, air traffic controllers can make $113,547, radiation therapists $76,627, dental hygienists $70,408, nuclear medicine technologists $69,638, nuclear technicians $68,037, registered nurses $65,853, and fashion designers $63,170, CareerBuilder.com reported in January. Related: How does your community college stack up? "You come out with skills that people want immediately and not just theory," Omer says. The Georgetown center estimates that 29 million jobs paying middle class wages today require only an associate's, and not a bachelor's, degree. "I would not suggest anyone look down their nose at the associate's degree," says Jeff Strohl, director of research at the Georgetown center. "People see those programs as tracking into something that's dead end," Strohl says. "It's very clear that that perception does not hold up." The bad news is that not enough associate's degree holders are being produced. Only 10% of American workers have the sub-baccalaureate degrees needed for middle-skills jobs, compared with 24% of Canadians and 19% of Japanese, the Organization for Economic Cooperation and Development reports. Over the last 20 years, the number of graduates with associate's degrees in the United States has increased by barely 3%. And while the Obama administration has pushed community colleges to increase their numbers, enrollment at these schools fell 3.1% this year, the National Student Clearinghouse Research Center reports. Graduation rates also remain abysmally low. Meanwhile, many people with bachelor's degrees are working in fields other than the ones in which they majored, according to a new report by the Center for College Affordability and Productivity. "We have a lot of bartenders and taxi drivers with bachelor's degrees," says Christopher Denhart, one of the report's coauthors. Still, the salary advantage for associate's degree holders narrows over time, as bachelor's degree recipients eventually catch up, says Schneider. Although these figures vary widely by profession, associate's degree recipients, on average, end up making about $500,000 more over their careers than people with only high school diplomas, but $500,000 less than people with bachelor's degrees, the Georgetown center calculates. As for Omer, he's already working toward a bachelor's degree. "Down the road a little further, I may want to become a director or a manager," he says. "A bachelor's degree will get me to that point." This story was produced by The Hechinger Report, a nonprofit, nonpartisan education-news outlet based at Teachers College, Columbia University. It's one of a series of reports about workforce development and higher education.